During the early days of television development in the USA it was necessary to monitor and adjust the quality of the transmitted picture in order to get the best definition. To do this, engineers required an 'actor' to constantly be under the burning studio lights as they tweaked and sharpened the image, and Felix fit the bill perfectly. He was the right colour (black and white), impervious to the heat from the lights and worked cheaply (in fact a one-off payment was all that was required). 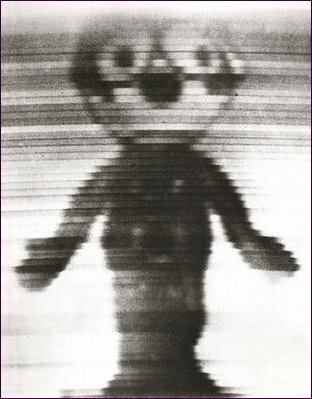 A small doll of Otto Meesmer's cartoon creation was purchased and placed on a turntable where it remained for almost a decade as the early experimenters strove towards the goal of a high definition picture. Incidentally, the terms "low definition" and "high definition" have been used quite a lot in these TV History articles, so just to set the record straight this is the difference: Low definition is classified as any transmission under 100 lines and high definition as any transmission over 100 lines, the higher the definition the greater the clarity of picture. In 1934 a UK report on the development of television insisted on a minimum standard of 240 lines and by 1937 had increased this demand to 405 lines. Television development moved faster in Europe than it did in America to the point where, in 1939 the New York Herald Tribune felt the need to publish an article that told it's readers that 'The BBC with its schedule of two or more telecasts every day as contrasted with the present American average of two to five hours a week is the measure between a smooth running, relatively intensive program schedule and a schedule hardly out of the engineering demonstration class." With hindsight that article seems a bit harsh -especially in light of the fact that many American's were continuing to work whole-heartedly on the development of television as something to be taken very seriously indeed , not least of all David Sarnoff, who was determined to be a force in US television. As the chairman of RCA (which made television sets and owned the National Broadcasting Company) Sarnoff began allocating company profits to the new medium. In 1938, NBC cameras transmitted live events from its experimental New York station. A year later, NBC Television began regular programming with coverage of the opening of the 1939 World's Fair. 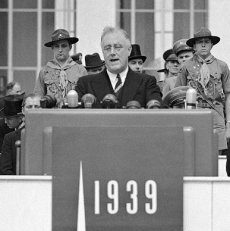 President Franklin Roosevelt was shown live, welcoming visitors to the event. (That made FDR the first incumbent president to appear on US television.) Two years later, both NBC and rival CBS received TV licenses for their respective New York City stations by the Federal Communications Commission. But as we know television development was curtailed worldwide very soon after, when the Second World War broke out, and this at a time when the medium was finally beginning to gain impetus. Within three years of the cessation of hostilities the US was to reverse the trend of being second best, in what many now consider to be its first golden age. The roots for this golden age were laid in the preceding years as the new television stations (they had not become networks yet) tentatively tested the broadcasting waters with outside telecasts of sporting events, variety presentations and even some chat shows. NBC broke new ground by broadcasting the first hour-long variety series; Hour Glass, which became a model for variety shows to come. It was among the first TV shows to have a major commercial sponsor -Chase and Sanborn Coffee. But it was an expensive show to produce, and Hour Glass ran only from May 1946 to March 1947. Also in 1947 baseball's World Series became the biggest televised event to date and there were debuts for the Kraft Television Theatre as well as the President himself, when Harry S Truman's State of the Union message was shown to an estimated private TV ownership audience of 170,000. 1947 also gave birth to perhaps US television's first superstar who quickly won the hearts of children from coast to coast, provoking desperate parents to book tickets for his show months in advance. The show took place in the 'Peanut Gallery'; the star was a wooden puppet called Howdy Doody. Television had arrived - and the golden age was dawning. By 1948 US television consisted of four networks (ABC, CBS, NBC and DuMont) and thirty stations which broadcast in 22 east-coast cities. The American public, having been given the hard sell over so many years, with a promise of what TV could and indeed would offer, were snapping up sets by their thousands on a weekly basis. One man in particular has been accredited with initiating this response. 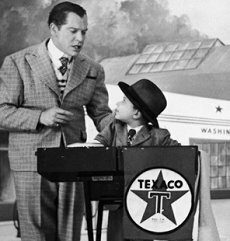 The oil company Texaco had established a hit radio series called 'Star Theater' and were now looking to transfer the format to the small screen. The comedian Milton Berle had hosted the radio series on a number of occasions and coming from a vaudeville background, which would have entailed polished skills in very visual as well as very verbal comic timing, was seen as having the right credentials to present the TV version. However, the sponsors were not prepared to put all their eggs in one basket, and so came up with a plan to test the public's reaction to their choice of host. Berle recorded the first show to be followed by Henny Youngman, Morey Amsterdam, George Price, Jack Carter, Peter Donald and then Harry Richman before Berle returned again for two more shows. With both critics and the public favouring 'Uncle Miltie', Berle got the job. In no time at all Tuesday night became known as 'Berle Night' and the man was dubbed "Mr Television." High production values were lavished on the shows, which echoed the days of vaudeville; a mixture of fast paced gags, musical and dance numbers and a host of guest stars. But it was always Berle who was the centre of attention, turning up in sketches with a whole glut of (well rehearsed) ad-libs. In the streets crowds gathered outside appliance stores to watch the show through plate glass windows and as a result sales were boosted. Significantly, sets were now being sold to working-class homes whereas in the past they were a luxury enjoyed by the wealthier section of the community. Up and down the country restaurants, stores and movie theatres noticed that Tuesday night trade was going down, as people stayed home in their droves to watch Television's first true superstar. Other comedians may have dubbed him 'The Thief of Bad Gags' but his place in television history was assured, and didn't the network know it; offering him a contract until 1981. The reaction to Berle's success was not lost on the TV Networks either and to their credit they wasted very little time in jumping on the television express train as it gathered momentum. 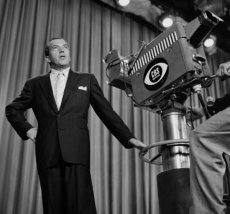 Within two weeks of Berle's formal debut CBS launched another TV phenomenon: The Toast of the Town, hosted by Ed Sullivan. If 'Star Theater' had harked back to the days of vaudeville and burlesque then 'Toast' wholly embraced it from the outset, being an unashamed mixture of all the elements from America's finest in the world of variety. The host introduced each act then withdrew gracefully to let them 'do their stuff' and do it they did -on 'Toast'- and then The Ed Sullivan Show for the next 23 years. Variety was definitely the spice of life for American television viewers for the next few years and showbiz immortals such as Bob Hope, Jackie Gleason and Sid Caesar all became household names. Their's are the stories of the legends of the small screen which we will cover in later articles, but around this time television was to take another very significant step in becoming an audience winner. In 1949 the oldest movie genre became television's newest novelty as the Western hit town. William Boyd had made over a hundred low-budget movies (for Republic Studios) in the Thirties and Forties as Hopalong Cassidy and in 1949 they were sold (along with other 'B' Westerns) to television for Sunday afternoon viewing. In fact to give Boyd his due after he discovered that Clarence Mulford, Cassidy's creator, had retained the merchandising rights to the radio series he set about purchasing them for himself. In the end it cost Boyd $350,000 and 1500 separate contracts were drawn up (and by all accounts so was a great deal of unpleasantness), but in the end he not only owned the merchandising rights but the television rights too, and what a shrewd move it turned out to be. The Hopalong Cassidy movies proved to be compulsive viewing, so successful in fact that between 1951 and 1952 Boyd produced 52 half-hour TV shows. By 1958 Boyd had 55 half-hour and 54 hour long shows playing on 250 television stations including dubbed versions in French, Spanish, Italian, German, Portuguese, Flemish and Japanese! The early Western shows Cassidy, Roy Rogers and The Lone Ranger were aimed at the young viewer and grown-ups had to wait until 1955 for the first grown up Western; Gunsmoke. This was followed in quick succession by Cheyenne, Wyatt Earp, Wagon Train, Bonanza, Rawhide and Laramie and all before 1960. Genre shows aside though, there was another area in which US television excelled in the 1950's and this was in live drama. Live drama was nothing new on US television in the 1950's. 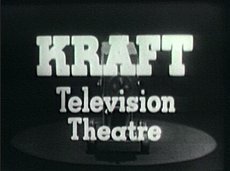 In fact, NBC had introduced the USA's first major series of live single plays with the Kraft Television Theatre series that began on 7 May 1947 and was promptly followed by NBC's Philco Television Playhouse. 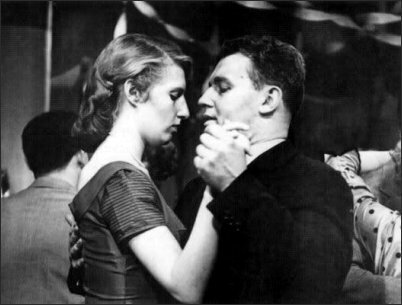 (Rival CBS brought out its own drama anthology, Studio One, in 1948.) So by the turn of the decade the programme makers were well versed in live drama, and the fact that the shows did go out live added to their appeal and in all probability the actors and actresses performances. For evidence of the legitimacy of live drama and the high esteem it was held in (and how fondly it is remembered today) look no further than the stars that came through the live drama process. The likes of Jack Palance, George C. Scott, James Dean, Paul Newman, Sidney Poitier, Jack Lemmon, Charlton Heston, Lee Marvin, Lee J. Cobb, Rod Steiger, Julie Harris, Lee Remick and Grace Kelly all emerged from this golden era of television drama. And so to did some memorable works, not least of all Paddy Chayefsky's classic TV play Marty starring Rod Steiger and Nancy Marchand, shown on NBC's Goodyear Television Playhouse on 24 May 1953. It became the first US play to be turned into a major motion picture and went on to win Academy Awards for Best Picture, Best Screenplay, Best Director and Best Actor, in the process propelling Ernest Borgnine (who took over the title role for the film) to the status of international star. There were other triumphs too, Rod Serling's Patterns (1955) and J. P. Miller's The Days of Wine and Roses (1958). No star was too big to appear on television, Bogart and Bacall joined Henry Fonda for The Petrified Forest and even Sinatra did the live drama gig. If there is one more thing that US television can be proud of it can with all credibility lay claim to having invented the most popular television formula of them all: The sitcom. One of the first of these made the transition to television in 1949, having become something of a radio classic. The Goldbergs was created and written by Gertrude Berg and told of the trials and tribulations of a Jewish family in the Bronx. In best US tradition the show managed the uneasy mixture of humour and warmth with pathos and poverty in its perceptive scrutiny of individual characters within the same family. That same year another lovable character was born, Jackie Gleason co-starred with Rosemary De Camp in a short-lived version of The Life of Riley before striking sitcom gold in The Honeymooners. 1950 could also lay claim to the birth of one of televisions first catch phrases as The George Burns and Gracie Allen Show finished each week with George telling his on and off-screen wife to "Say goodnight to the folks, Gracie." But if you want to talk about sitcom gold then you can't do much better than the offering from CBS in 1951. I Love Lucy (in one form or another) ran almost continuously from 1951 until Lucille Ball's retirement from weekly television in 1974. A smash hit from it's first season, Lucymania swept America, and when in 1953 Lucy gave birth to Ricky Jnr, an event that coincided with Ball's real life delivery, it actually headlined in newspapers above President Eisenhower's inauguration. 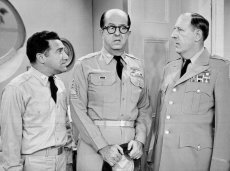 The Phil Silvers Show (originally titled You'll Never Get Rich and know almost universally as Bilko) introduced televisions first lovable rogue. Master Sergeant Ernest Bilko was the master schemer who devoted all his waking hours to thinking up 'get rich quick' schemes. Under the consummate skills of its lead actor and fine supporting cast Bilko also became something of a television legend. The series is still being shown on British TV to this day... it's a mystery why Lucy is not. 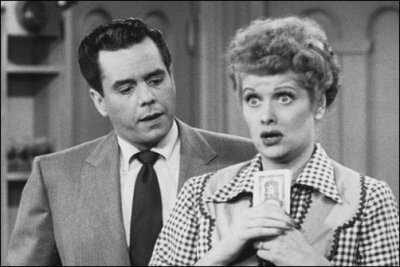 "Lucy's" popularity sparked other situation comedies in the early and mid-1950's, including Eve Arden's Our Miss Brooks; the live Mr. Peepers with the gifted Wally Cox; The Adventures of Ozzie And Harriet, which remains the longest-running sitcom in US history (14 years); Danny Thomas' Make Room For Daddy; the domestic comedy Father Knows Best; and NBC's near-carbon copy of I Love Lucy; I Married Joan with Joan Davis. As the decade began to slip away so did that most prolific period of US television. By the mid-1950s, televisions were in most American homes. They were no longer the status symbols of the rich and upper middle-class. That meant the composition of the average viewer changed as well. In the early 50s, upscale game shows, dramas and sophisticated comedies thrived. But increasingly, viewers shifted their allegiances to filmed series and more accessible formats. The "adult" westerns and sitcoms were one response to the shift; so were big money and merchandise-oriented game shows such as The $64,000 Question; Twenty-One and The Price Is Right. While those shows thrived, live dramas were slipping in the ratings. Variety show hosts such as Sid Caesar, Milton Berle and Jackie Gleason were also losing audiences. There were technical changes as well. The east-west coaxial cable was finally operating by the fall of 1951, allowing programs to be shown from the East to the West coast, and vice versa. It would be just a matter of time before Hollywood-produced series dominated American television, much as the movie studios of Hollywood churned out the majority of films Americans saw. But the studios resisted television with all their might, feeling the tube would hurt film attendance (some studios even ordered their biggest stars not to do television). It was to no avail; more and more people stayed home watching TV instead of going to the movies. One of the few holdouts was Columbia, which created the Screen Gems division to produce television shows, but most filmed series in the early days of TV were produced by independents, including Lucille Ball and Desi Arnaz's company Desilu and Mark VII Productions, the firm owned by Jack Webb that produced Webb's hit police drama Dragnet. There were also changes among the television networks. During the early days of TV, NBC dominated the ratings with its lineup of live comics and dramas. But CBS, sparked by chairman Bill Paley's eye for talent, took more of a chance with filmed sitcoms-and the gamble paid off handsomely with Lucy; Burns and Allen; Our Miss Brooks and the warm family drama Mama.' (CBS also had the very popular Arthur Godfrey, who had two top-ten prime time shows on the network; plus Jack Benny; Ed Sullivan and Jackie Gleason.) In 1955, ABC lured Warner Brothers-one of the "big eight" movie studios at the time-to produce a new series for the network. Warner Brothers Presents rotated three shows based on past WB movie hits -Casablanca, King's Row and Cheyenne. Only Cheyenne became a hit; WB dropped the anthology format and made Cheyenne a series of its own a year later. Soon, other studios began to get into the television production game. The move to filmed series signaled the end of live dramas and comedies. So did the invention of videotape in 1956, giving programs a "live" look without the problems associated with live broadcasting. By 1957, more than 70-percent of all US prime-time series were filmed or videotaped; three years later, weekly live shows would all but disappear. ABC's success with filmed studio shows (especially the products from Warner Brothers) improved the network's ratings; by 1960, ABC was the top-rated network in major cities where all three networks had full-time affiliates. ABC and Warner continued to churn out second and third-rate copies of such action-adventure hits as 77 Sunset Strip and The Untouchables, two of the network's most-popular shows and ABC's formula of "two parts private eye, one part cutie pie" eventually lost favour with viewers. ABC was not alone in the race for mediocrity. 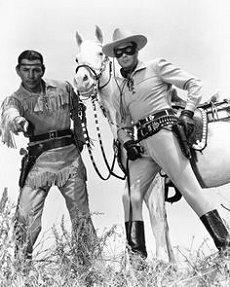 By the late 1950's, American television was filled with formula sitcoms, predictable westerns and violent dramas. Critics howled, but to no avail; viewership continued to rise. It all came to a head in 1959, when US television faced a real public relationship crisis with the "quiz show scandal." Viewers learned that clean-cut and intelligent Charles Van Doren, who won $129,000 on the quizzer Twenty-One, had been given the answers in advance, and was coached to pause and hesitate for dramatic effect. So were contestants on other quiz shows, including The $64,000 Question and a connect-the-dots game called Dotto. In some ways, memories of the "Golden Age Of Television" in the US were quite selective. Some critics either forgot (or failed to mention) there were some truly bad programmes and awful dramatic productions that should have never seen the light of day. And of course, today's technology and more relaxed moral standards have made some programmes look somewhat dated. But you have to start somewhere, and American television got off to a very good start. At its best, the "Golden Age" shined bright indeed.